Al-Arqam ibn Abi'l-Arqam RA (c.597-675) was a companion of Rasulullah ﷺ. Al-Arqam ibn Abi'l-Arqam RA was the owner of the house where the early Muslim community held its meetings. Al-Arqam ibn Abi'l-Arqam RA was from the Makhzum clan of the Quraish tribe. His father, known as Abi'l-Arqam, was Abd Manaf ibn Asad ibn Umar ibn Makhzum. His mother was Umama bint Al-Harith from the Khuza'a tribe. Al-Arqam ibn Abi'l-Arqam RA married Hind bint Abdullah from the Asad tribe, and their children were Umayya and Maryam. By various concubines, he was also the father of Ubaidullah, Uthman and Safiya. The descendants of Ubaidullah died out; all of Al-Arqam's surviving descendants were through Uthman. 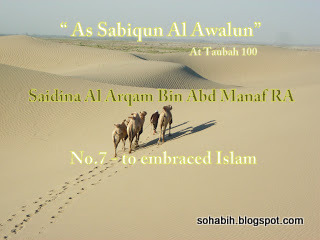 Al-Arqam ibn Abi'l-Arqam RA is seventh on the list of "people, who became Muslims at the invitation of Abu Bakr RA," who of course were the total list of all Muslims. Al-Arqam ibn Abi'l-Arqam RA joined the general emigration to Madinah in 622, and Rasulullah ﷺ granted him a house there in the Zurayq quarter. Al-Arqam ibn Abi'l-Arqam RA fought at Badr and, at the division of the spoils, asked for and obtained a sword named al-Marzuban. Al-Arqam ibn Abi'l-Arqam RA also fought at the Uhud, the Battle of the Trench and "all the battles with Allah’s Rasul. 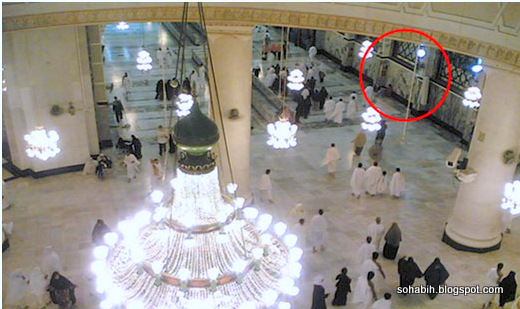 the beginning of Saei - In Haj and Umrah Ibadah. In the light of these inhuman persecutions, Rasulullah ﷺ deemed it wise to advise his followers to conceal their conversion, in both word and deed. Rasulullah ﷺ took the decision to meet them secretly lest Quraish should get to know of his designs, and so take measures that might foil his goals. Rasulullah ﷺ also had in mind to avoid any sort of open confrontation with the polytheists because such a thing at this early stage would not be in the interest of the newly-born Call, still vulnerable and not fully fledged. Once, in the fourth year of Prophethood, the Muslims were on their way to the hillocks of Makkah to hold a clandestine meeting with Rasulullah ﷺ, when a group of polytheists did observe their suspicious movement and began to abuse and fight them. Sa‘ad bin Abi Waqqas RA beat a polytheist and shed his blood and thus recorded the first instance of bloodshed in the history of Islam. Rasulullah ﷺ, on the other hand, used to proclaim the Islamic Faith and preach it openly with deep devotion and studious pursuit, but for the general welfare of the new converts and in consideration of the strategic interest of Islam, he took Dar Al-Arqam, in As-Safa mountain, in the fifth year of his mission, as a temporary centre to meet his followers secretly and instruct them in the Qur’an and in the Islamic wisdom. The harassment and persecution of Muslims by Quraish polytheists (mushrik) in Makkah was increasing, and the Muslims could not worship comfortably. Al-Arqam's house was selected as a safe place to meet, pray and learn about the faith because it was located on the east of As-Safa Hill, where Rasulullah ﷺ was living at the commencement of his prophetic mission. The house could be entered and exited secretly because it was in a narrow street, and the street could be surveyed from within. In the fifth year of the mission Arqam’s house, which became known as the House of Islam, can be regarded as the first Islamic school, with Rasulullah ﷺ as the teacher and the first Muslims as its students. physical proved of history totally wiped out. New converts were brought to Al-Arqam's house. In the sixth year of the mission (615-616 CE), two powerful citizens of the Quraish tribe, Rasulullah’s uncle Hamzah ibn Abdul Muttalib RA and Umar ibn Al-Khattab RA, entered to announce their adoption of Islam. Umar's conversion brought the total to forty men, after which the members of the group embarked on a mission to spread Islam to the world. 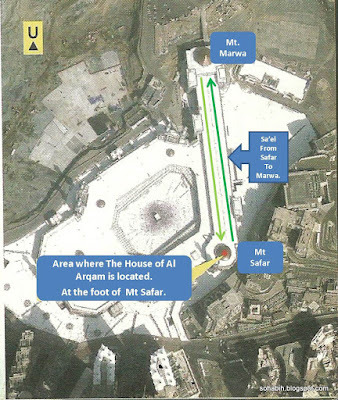 This area, at the foot of Mount Safa was the approximate area where Darul Arqam (The house of Arqam) was located. 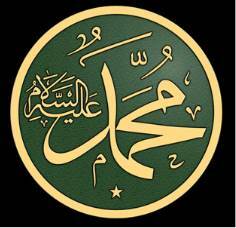 It was here in the initial period of Islam that Rasulullah ﷺ secretly preached Islam. Al-Arqam ibn Abi'l-Arqam RA bequeathed his house to his son on the condition that it would not be sold. However, in the time of Abu Jaafar al-Mansur, one of Al-Arqam's grandsons was persuaded to sell his share in the house for 17,000 dinars in exchange for being released from prison; and his relatives were then bribed into selling their own shares. This house is now called Daru’l-Khayzuran after a subsequent owner. It is opposite the Kaabah and is used as a religious school today. Al-Arqam ibn Abi'l-Arqam RA joined the general emigration to Madinah in 622, and Rasulullah ﷺ granted him a house there in the Zurayq quarter. He fought at Badr and, at the division of the spoils, asked for and obtained a sword named al-Marzuban. He also fought at the Uhud, the Battle of the Trench and "all the battles with Allah's Messenger." He died during the reign of Muawiyah in the year 675 (55 A.H.). Darul Arqam in the Al Quran. The house belonged to a Sahabi named Al-Arqam ibn Abi'l-Arqam RA for some time after Rasulullah ﷺ proclaimed his Prophethood; this house was the secret centre of propagation. It was here that the Muslims gathered to perform Salat and to learn about Islam. As it was a short walk away from the Ka’abah and its bustling crowds, the pagans who lived nearby did not take notice of the many people who used to gather here. 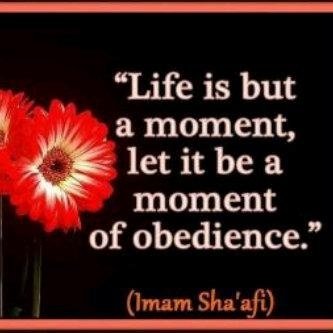 “O Prophet, Allah is sufficient for you, and for those who follow you among the believers.” [8:64] Al Anfal. § Khabbab RA told him that he was at the house of Arqam near the Safa Gate with many of his companions. § Umar Ibn Al Khattab went to Safa, knocked at the door of the house, and said who he was. The Sahabah had been warned that he was coming but they were struck by the subdued tone of his voice. One of the companions went to the door and looked through a chink and came back in some dismay. “What has brought thee here, O son of Khattab? I cannot see thee desisting until Allah sent down some calamities upon thee”. “O Messenger of Allah,” said Umar, “I have come to thee that I may declare my faith in Allah, and in his Messenger and in what he has brought from Allah”. “Allahu-Akbar!,” said Rasulullah ﷺ, in such a way that every man and woman in the house knew that Umar had entered Islam; and they all rejoiced. § Because the valor and courage of Umar Ibn Al Khattab RA was acknowledged by all, it was after his conversion to Islam that the Muslims started performing salah in the open and Islam was propagated in public. Rationale on why Al Arqam House was chosen to the first place of congregation and propagation of Islam. According to Syeikh Muhammad Munir Rahimullah in his Kitab “Manhaj Haraki” in detailing the Seerah of Rasulullah listed the rationale and wisdom in choosing Al Arqam Ibn Abi Arqam RA’s house. 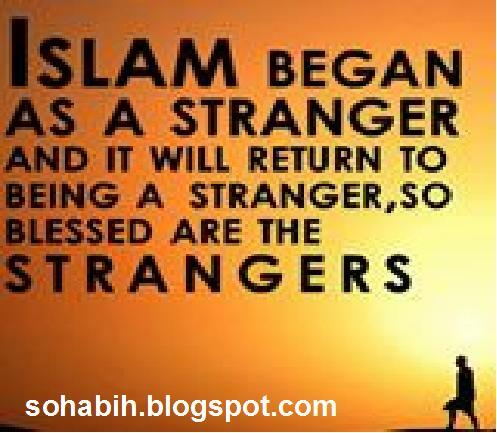 the begining time of Islam. 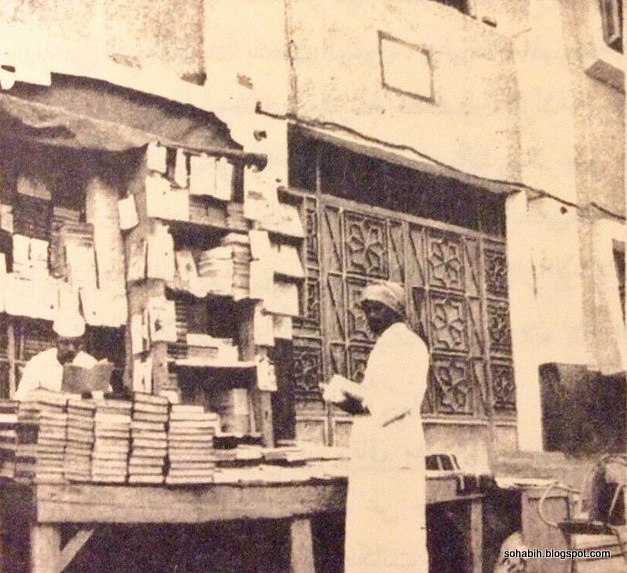 Al Arqam Ibn Abi Arqam was chosen to the first center of gathering and “markaz” of the early years of Islamic dakwah. · Al Arqam Ibn Abi Arqam RA belongs to the tribe of Bani Makhzum and known to be the enemy of Banu Hashim. Thus, if Al Arqam Ibn Abi Arqam RA conversion to Islam is known by both tribes a feud may occur between them and Al Arqam Ibn Abi Arqam RA will be defended by Bani Makhzum. · Al Arqam embraced Islam at an early young age of 16 years old. During these early and difficult years. The Quraishi leaders always met to discuss and finding out the place where the early Muslim gather. However never came to their thinking of Al Arqam”s house. So they never thought of raiding and checking Al Arqam’s place. Much due to the Quraishi perception that Al Arqam Ibn Abi Arqam RA was just a young teenager at that time. · The Banu Quraish did not aware that Al Arqam Ibn Abi Arqam RA embraced Islam making his house the safest haven for gathering and transmission of knowledge about Islam for the early Muslim. Rasulullah and his companion make best of these opportunities likes the house being strategically located, strong sense of kinships among the Arab and the care-less attitude towards their youngsters. The above are brief rationales and wisdom (of course with the will of Allah SWT), the choice of making Al Arqam’s house to be the first center of Islamic propagation. From the above we may observe that in Dakwah elements of the surrounding environment, culture and practices was taken into consideration to ensure a successful result in propagation of Islam in any era. As of today with the continuous deceptions of electronic media own by the kafir about Islam, such as distorted perception of Islam, Islamic phobia and the those small percentage of Muslim deviated from the main tenets of Islam – terrorist, in cohort with the enemy of Islam and perceiving to be the mainstream, tarnishing the purity of Islam. However, the above scenario of early Muslim strategy in Dakwah will guide us today to ensure successful propagation of this truth to the unbelievers. 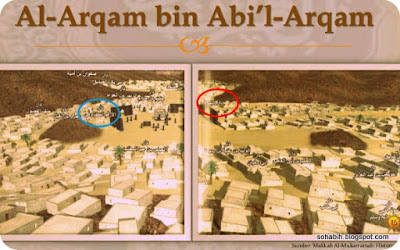 Another point of interest about “The house of Al Arqam bin Abil Arqam. Dar-e-Arqam is a place which was used by Rasulullah ﷺ as a hidden location where Rasulullah ﷺ could quietly carry on his divine mission. Rasulullah ﷺ used the place for few years during the initial period of Islam to preach teachings of Islamic faith, establish contacts and devise strategy. 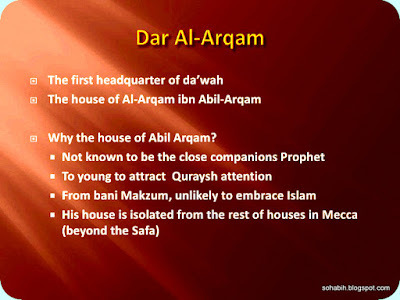 Darul Arqam was in fact the house of Al Arqam bin Abi Arqam Quraishi Makhzumi, who was a young companion and close confidant of Rasulullah ﷺ. Al Arqam bin Abil Arqam RA was 16 when Rasulullah ﷺ chose his house as a secret headquarters. He was among those companions who believed in the Prophethood of Rasulullah ﷺ at the very beginning. It becomes evident from the authentic history books, which have documented in detail the initial period of Islam that just about thirty people had embraced Islam at the time Rasulullah ﷺ selected the house of Al Arqam to be quietly used for the propagation of Islam. This house was located at the foot of Mount Safa. It was situated at a distance from the gatherings and meeting places of Quraish. Generally there was no hustle and bustle and comings and goings around this house because there was no market place and no other inhabitation near this locality. Access to this house was easy because it was not too far from the centre of Makkah. This house was not even situated on a high place. Although Mount Safa was not too high, but being situated at the foot of Safa it was difficult for those coming in and going out of Makkah to check the movement of people who were visiting this house. One more point which is of utmost significance is that Al Arqam RA belonged to the tribe of Bani Makhzum. During the period of pre-Islamic times this tribe and Bani Hashim clan had unfriendly relations with one another. In this background it was unimaginable for the tribes living in Makkah that Rasulullah ﷺ would make the house of Al Arqam RA as a centre for propagating Islam. In this regard, it is also noteworthy that Al Arqam RA was not holding any major position among the Quraish. Then choosing the house of a younger person instead of a relatively well-known, mature and prominent older figure was a reflection of the vision of Rasulullah ﷺ. Common people generally keep an eye on the houses of those who have attained prominence in the society and the people visiting such houses do become a matter of discussion in every street and every corner. By going through the details of the part of history which surrounds around the Dar-e-Arqam, it can easily be perceived that secrecy was maintained up to the maximum possible degree. Even the young and the women folk associated with Rasulullah ﷺ would seriously follow the set of principles regarding confidentiality and accordingly take precautionary measures in this respect. History also tells us about the extraordinary precautions taken in the construction of Dar-e-Arqam. Small holes were made in its door in such a way that anyone coming from outside can easily be recognized by looking through these hollow spaces, while the outsider could not see what is going on inside the house. The episode of Saidina Umar Ibn Al Khattab RA comes to mind when he went to Safa and knocked the door of Darul Arqam. Before opening the door, one of the companions of Rasulullah ﷺ, by looking through one of these ‘magical’ holes, identified Saidina Umar RA who had girded his sword. Rasulullah ﷺ was informed about the coming of Umar. It is amazing that the technology nowadays used in modern houses was brought into play in those years. One aspect of precaution is that in case of any emergency such a course of action be adopted which is relevant to the circumstances. So, Rasulullah ﷺ advanced towards Umar and firmly caught hold of the hilt of his sword as well as his hands and arms. 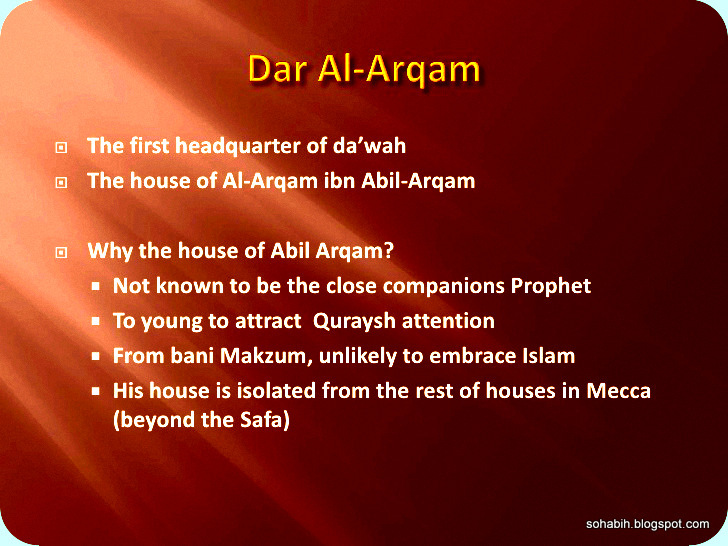 Why Darul Arqam was chosen to be the first sanctuary of early Muslim. Rasulullah ﷺ by making Darul Arqam as the focal point of his struggle, not only provided a proof of his superior wisdom and divine insight but the lesson and message given to the future generations through it includes various important aspects and features, which have left deep impressions on the Islamic history and struggles. It also becomes clear that Islam was not only based on some religious and devotional rules and regulations, but also possessed a wider message and goal. Otherwise, there was no need to adopt such secrecy for so many years for the stability of Islam, for grooming his initial companions and laying foundations for planning future course of action. Similarly, there was no need for the enemies of Islam to resort to different kinds of machinations and acts against Rasulullah ﷺ unless they felt there was likelihood that Islam would prosper owing to its universality. Learning’s for today Muslim Ummah. The matter of secrecy becomes all important and profound when the movement is all-inclusive, when the message is of the utmost importance, when the situation is too serious, when the enemy is too superficial and narrow-minded and when preparing people for a cause is critically important. Rasulullah ﷺ had come as the last messenger from Allah to mankind. It depended on the success of Rasulullah ﷺ to make the endeavors of all the past prophets fruitful and meaningful. Rasulullah ﷺ had to safely transfer onwards the legacy of all the prophets. 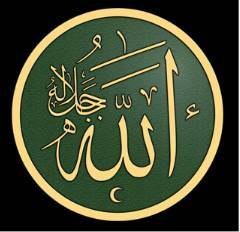 The religion was to be completed and perfected by Rasulullah ﷺ. Acting as a visionary and sagacious leader, Rasulullah ﷺ was mindful of all the aspects including hot-tempered nature of Arabs, linkage the economy and leadership of the elders of Quraish had with different forms of idolatry, benefits of Quraish that were protected in the belief of polytheism and expected damage the interests of Quraish would witness in case the monotheistic movement succeeded. Apart from ensuring the safety of his companions, Rasulullah ﷺ was also conscious of their grooming and self-purification. It was also among the obligatory duties of Rasulullah ﷺ to provide spiritual as well as ideological training to his companions besides making them comprehend the secrets and objectives of the divine movement according to their intellectual capacities. Rasulullah ﷺ had to provide guidance and leadership simultaneously bearing in mind the principles of security and forward progress. In these conditions, Rasulullah ﷺ would speak his mind where it was necessary to do so and he would keep his mission secret where the situation demanded concealment. Therefore, Rasulullah ﷺ openly declared his prophetic mission by standing on top of a high rock on Mount Safa. On the other hand, he exercised extreme caution by adopting the strategy of making Darul Arqam a secret place for the propagation of Islam. Similarly, by ordering his followers to migrate to Habshah (present-day Ethiopia), Rasulullah ﷺ on one hand saved them from the persecution of the Quraish and on the other the message of Islam reached across the borders by this act. The migration to Habshah also proved that Rasulullah ﷺ is the link in the chain of Prophethood starting from Adam as well as the inheritor of past prophets. By examining these different aspects, it becomes clear that by ignoring other measures taken by Rasulullah ﷺ it is not possible to determine the significance of the game plan adopted as a result of choosing Darul Arqam as a secret place. The importance and value of this initiative can be gauged by taking into consideration other steps at the same time. at the foot Mount Safwa. When the enemies were only thinking of repression, the divine leader, despite having limited resources, was swiftly carrying his movement forward with sagacity and deep insight and continuously taking various kinds of safety measures in this respect. For this Rasulullah ﷺ was busy in transforming apparently weak and insignificant people into a formidable force in such a way that it was difficult for his enemies to pay attention towards this fact. Reposing trust and confidence in younger people and making possible for them to take responsibilities of vital duties as well as utilize the services of women, who were the weakest segment of that society, to accomplish very important tasks is not less than a miracle of Rasulullah ﷺ. Although, the remains of Darul Arqam have been demolished, but by peeping through the window of its history, we can deduce that it is contrary to the divine conduct and behavior of Rasulullah ﷺ to divulge every details of his plans, to demonstrate harsh, violent and rapid reaction in the face of every problem or event, to show unnecessary and excessive concern about every issue and to weaken every plan of action by creating an uproar about it. Nowadays, the political leaders of the Ummah are seeking guidance and counsels from the enemies by allowing them to sit in their ‘Darun Nadwah’ [house which functioned as a house of Parliament for the Quraish and it was from here that they plotted to kill Rasulullah ﷺ. Philosophical and wise principles, which we have inherited from Rasulullah ﷺ and other prophets, are waiting to be followed in letter and spirit. We need to put our heads together and ponder how in the early Islamic era of Rasulullah ﷺ although having minimum means and resources, succeeded against a resourceful and influential enemy. We must think over why Muslims have become disgraced and discredited people today despite being rich in material as well as human resources and this declining journey does not seem to be ending. Instead of drawing lessons about secrecy and confidentiality from the history of Darul Arqam, we have thrown everything open for all to see. It is beyond doubt that Muslims can’t emerge from the present distressed state and regain strength and honor without having firm belief in Allah and fixing superior goals. Salvation of humanity from ruthless capitalism, which is the torchbearer of materialistic civilization, is only possible by adopting Allah fearing culture and civilization. Alas, back to cultures and heritage of the early Muslim and Islam similarly we don’t have any physical structure to show and inherit by us. History of the house of Al Arqam bin Abil Arqam was completely desecrated by the current ruler in Makkah. All in the name of modernity, facilitating and expansion of the Al Haram the most sacred placed on planet earth.